Sprinkle salt, paprika and cumin over the liver and then mix. In a wide plate place the flour and dip the livers into the flour. Shake the excess flour. Over high heat, sizzle the oil in a skillet and fry the livers for 4-5 minutes, till they are cooked. Place the cooked liver on a paper towel to get rid of the excess oil. 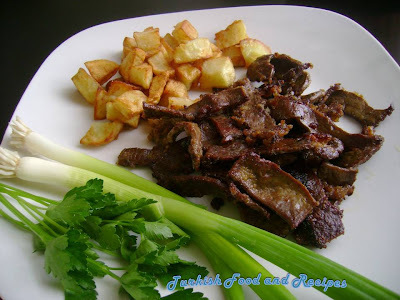 Finally, place the shallow fried beef liver in a serving plate and serve warm. Pilaf and fried potatoes are good to go with Shallow Fried Beef Liver. Dogranmis cigerlerin uzerine tuz, biber ve kimyon serperek, harmanlayin. Sonra icine un koydugunuz tabagin icinde una bulayin. Fazla unu silkeleyin. Yuksek ateste kizdirdiginiz yagda 4-5 dakika kizartin. Kagit havlu koydugunuz bir tabaga kizarmis cigerleri koyup, fazla yagin suzulmesini saglayin. Son olarak; servis tabagina alip, sicak servis yapin. Dana Cigeri Kavurmasini pilav ve patates kizartmasi ile servis yapabilirsiniz.